Authorities arrested a man suspected of shooting the security guard of a news crew that was robbed while covering the Oakland, California teachers strike, according to a statement by the CBS affiliate. KPIX said a reporter and a photographer were gathering interviews Sunday about the strike at the Oakland Library when a car pulled up and the driver pulled a gun, demanding their camera. The crew surrendered the equipment and began walking away. The suspect then shot the guard, Matt Meredith, in the leg, the news station said. KPIX reporter Joe Vazquez said on Twitter that the guard, a retired Berkeley police officer, exchanged gunfire. An Alameda County Sheriff spokesman says a 21-year-old man with several gunshot wounds walked into a nearby hospital after the incident. 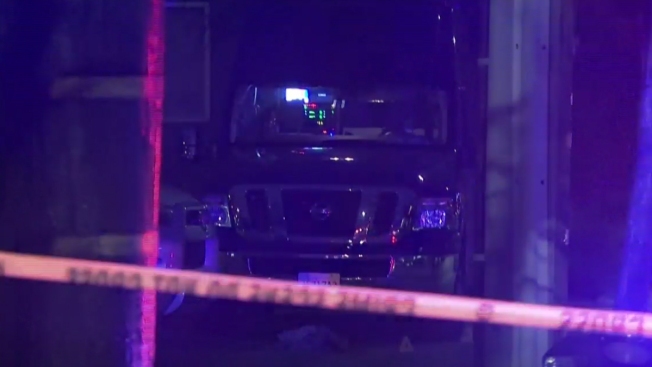 Oakland police arrested the man on suspicion of shooting the news crew's guard. The guard's condition wasn't immediately known. No other information - including what time the robbery took place - was immediately released. It's not the first time the station has been the target of theft. In November 2012, a group of men punched a KPIX cameraman while he was filming in front of an Oakland high school and fled with his camera while it was still recording. Robberies of television news crews and still photographers have plagued the San Francisco Bay Area in recent years. The Associated Press tallied five robberies in 2012, two in 2013, three in 2014 and at least three in 2015 plus several burglaries of vehicles. "We don't know what the market is for these cameras," San Francisco Police Sgt. Michael Andraychuk told The Associated Press in 2015. Even though the cameras can cost upward of $50,000 each, it is specialized equipment that can't be easily sold on the black market, Andraychuk said, and none of the stolen cameras have turned up on Craigslist, eBay or any other online marketplace.